A 22-year-old man has become the first person in the UK to be convicted for modifying a video games console. The Cambridge graduate was sentenced at Caerphilly Magistrates' Court to 140 hours of community service. The man had been selling modified Xbox consoles which he fitted with a big hard drive containing 80 games. "This case sets a major precedent which marks a milestone in the fight against piracy," said games industry spokesman Michael Rawlinson. The conviction is the first of its kind in the UK, where the modification of video games consoles has been an illegal practice since October 2003, when the UK enacted the EU Copyright Directive. 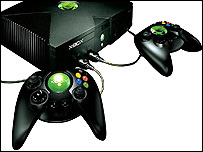 Consoles such as the Xbox and PlayStation 2 can be modified by chips that are soldered to a console's main circuit board to bypass copyright controls. In this case, the man was tracked down by an investigator working for the UK games industry trade body, the Entertainment & Leisure Software Publishers Association, (Elspa). The man, who has not yet been named, was selling modified Xbox consoles, fitted with a 200GB hard drive and 80 pre-installed games, via his website for £380. Elspa informed Caerphilly County Borough Council Trading Standards and Gwent Constabulary, as well as helping to collect forensic evidence used by the prosecution. The man was sentenced to 140 hours community service and ordered to pay £750 in costs. The court also seized his equipment - three PCs, two printers, three Xbox consoles and 38 hard drives. "It sends a clear message to anyone tempted to become involved in chipping consoles that this is a criminal offence and will be dealt with accordingly," said Mr Rawlinson, deputy director general of Elspa. "The modification of consoles is an activity that Elspa's anti-piracy team is prioritising. It is encouraging to see the UK courts do the same." In July last year, Sony won a legal battle to ban the selling of mod chips in the UK.